Radishes are one of the easiest and quickest of all crops to grow. 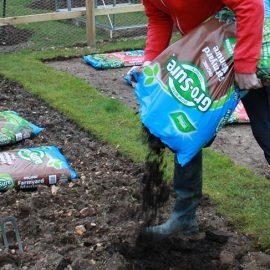 Prepare the ground by digging in Gro-Sure Farmyard Manure during the autumn. Sow seeds from early spring in the open soil. Sow in shallow drills and water the soil along the row if it is dry at the time of sowing. Slugs enjoy radishes, so protect your plants with Eraza Slug and Slug Killer. Harvest when they are big enough to eat. Discard any that are too large or old because these will be too woody as well as too hot to eat.